Roads are the dominant means of transportation in India today. They carry about 90 percent of country's passenger's traffic and 65 percent of its freight. Over the last two decades, there has been a tremendous increase in the vehicle population. This proliferation of vehicles has led to several problems. Potholes formed due to heavy rains and movement of heavy vehicles also become a major reason for traumatic accidents and loss of human lives. To address the above mentioned problems, a cost effective solution is needed that collects the information about the severity of potholes and also helps the drivers to drive safely. With the proposed system an attempt has been made to endorse drivers to ward off the accidents caused due to potholes. Naeem Abbas et al. propose the ‘Real Time traffic density count using Image Processing wherein the video signals and images are captured from camera using MATLAB followed by selecting of vehicles by using cropping technique. Next object detection is carried out by enhancing the image and finally number of vehicles is counted. Rajeshwari Madli et al. ‘Automatic Detection and Notification of Potholes and Humps on Roads to aid drivers’ and consists of three parts: Microcontroller module is used to gather information about potholes and humps, geographical locations and to be sent to the server which is then processed by server to give timely alerts. Luo Zongfan and Zhong Ming propose the ‘Annual Average Daily traffic Estimation from Short Traffic Counts’. Pothole Tracking System was launched 4 years back for Mumbai City wherein potholes were reported by the citizens every time it was spotted to the road maintenance work around them. 1. To ensure safety of the commuters. 2. Our application suggests alternative routes to the user in times of heavy traffic congestion and detects potholes on a given path. 3. A given route is divided into segments and the traffic density in very segment is notified to the user. 4. The accelerometers in mobile phones detect presence of potholes based on the vibration ratio we set. 5. When three users detect the presence of a pothole, a mail is sent to the Corporator, indicating the location where the pothole was detected. 6. The same information is uploaded to a public website for the knowledge of other commuters. 7. If the pothole is rectified, the data can be recovered from the transaction database and the same is updated to the website. We are developing an android app for traffic info which also detects potholes and acts like a warning system. Each vehicle has its own speed limit. So based on a single vehicle, we cannot estimate the traffic density of that road. We make use of Global Positioning System (GPS) which is a space-based navigation system and it captures the location and time in all weather conditions, anywhere on the Earth. By GPS, we can find out if the vehicles are moving slowly, thus there is traffic congestion and we can determine that the road has high density traffic. The user first selects the mode of transportation and specifies the source and destination. There is an option for the user to specify the distance within which he wishes to know the traffic information.GPS then gives a route and the application displays the segments containing the traffic density of different kind of transportation along the path. The average speed of the the vehicles in that particular path is also displayed. This helps the user to select an optimum path with low traffic. The information regarding the traffic is updated frequently. Traffic density also depends on disorganized mess such as potholes. Whenever a vehicle passes over a pothole, the accelerometer senses the vibration and if the vibration value is equal to the one specified in the code, the latitude and longitude value of the pothole is stored into the database. The database stores all values of the potholes detected. If a pothole is detected three times by the user then a mail is sent to the Corporator automatically by the system regarding the location of the pothole and the same is updated to the public website. Once the problem is rectified, potholes values are removed from the database and also from the public website by the admin. In this project we make an assumption that commuters on the road use this application, which makes it easy to know traffic related information. The implemented application enables the users to reach a destination from a given source based on the vehicle density and it also detects the potholes and warns the users about the same thus ensuring safety of the commuters. Our application suggests the route in form of segments where the traffic density is calculated for each segments. And the values of these segments are refreshed for every one minute so that the user can get a clear view of the traffic density of the route selected. 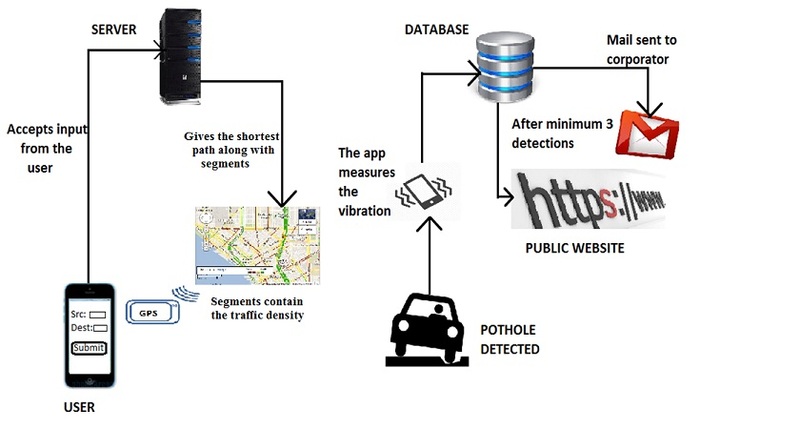 The application also concentrates on detecting potholes on the given stretch. Our implementation consists of warning system which warns the users about the potholes within 100 meters range. Once three or more such potholes are detected by the users at the same latitude and longitude position, a mail is sent to the Corporator and the same is uploaded in the public website. When the pothole is rectified, the data is removed from the transaction database and is updated to the public website. Overall, the application concentrates on helping the Corporation by reporting the condition of the roads and also helping the commuters to drive safer. Our implemented system sends a mail to the Corporator only once when the pothole is detected for a minimum of three times. 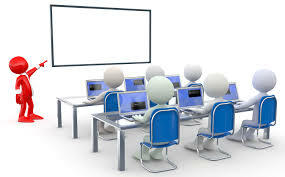 To enhance it, we can send a reminder mail to the Corporator at least three times and if the problem is still not rectified we can send a mail to the higher authorities. We can use Greendroid in the current system. Greendroid is a power consumption tool for android eco systems. In the near future when we see NAVIC being implemented in mobile phones, we can design our application using NAVIC (Navigation with Indian Constellation). This paper,automatic detection of potholes and humps and alerting vehicle drivers to evade potential accidents are the major purposes. The proposed approach is an economic solution for detection of potholes and humps, as it uses low cost ultrasonic sensors. The mobile application used in this system is an additional advantage as it provides timely alerts about potholes and humps. The solution works in all season and specially when potholes are filled with muddy water as alerts are generated using the information stored in the database. We feel that the solution provided in this paper can save many lives and ailing patients who suffer from tragic accidents. The proposed system considers the presence of potholes and humps. However, it does not consider the fact that potholes or humps get repaired by concerned authorities periodically. This system can be further improved to consider the above fact and update server database accordingly. Rajeshwari Madli1, Santosh Hebbar2, Praveenraj Pattar3, G.V.Prasad, “Automatic Detection and Notification of Potholes and Humps on Roads to Aid Drivers”, IEEE Sensors Journal, 2015. Fleischer, Paul Benjamin; Nelson, Atso Yao; Sowah, Robert Adjetey; Bremang, Appah, “Design and Development of GPS/GSM Based Vehicle Tracking and Alert System for Commercial Inter-City Buses”, University of Ghana. Sudarshan S. Rode, Shonil Vijay, Prakhar Goyal, Purushottam Kulkarni, Kavi Arya, “Pothole Detection and Warning System”, In Proceedings of International Conference on Electronic Computer Technology, 2009.